One thing that comes to mind when you think of Alexis Sanchez is his ability to play for long without having signs of fatigue. It baffles fans to see him ever-ready to feature in every game and that is why he has earned the name 'workaholic'. Some of his Nigerian admirers have even started calling him 'Dangote Trailer'. Well, the Chilean international has ended our curiosity by coming out to reveal what he does to keep fit all the time. 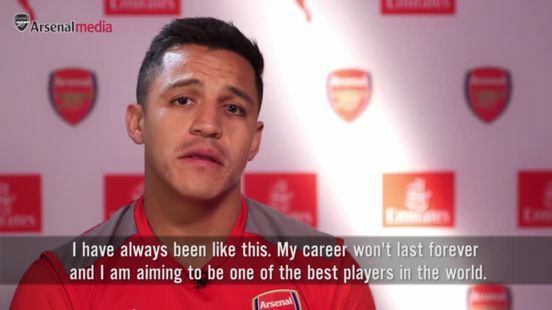 “I have always been like this,” Alexis told Arsenal Player. “My career won´t last forever and I am aiming to be one of the best players in the world. I want to do my best and be professional until my career ends. “I enjoy football a lot, I always wanted to be one of the best players in the world and I've been saying that since I was a little boy. I will slow down after I retire, but for the time being I will carry on like this.